As a gardener, I love rain. As a soccer mom, not so much. Having to tell our girls that their games have been rained out occasionally results in tears. So imagine our surprise when we told Lou that her last game of the season had been canceled and there were no tears, no scowl, no bad mood. Instead, a smile lit up her face as she realized that perhaps her beloved kindergarten teacher Miss Choate could make the rescheduled game. Maybe, just maybe, we cautioned Lou, not wanting her to get her hopes up. But, some things are meant to be (or bee, in this case). Miss Choate came. She cheered. 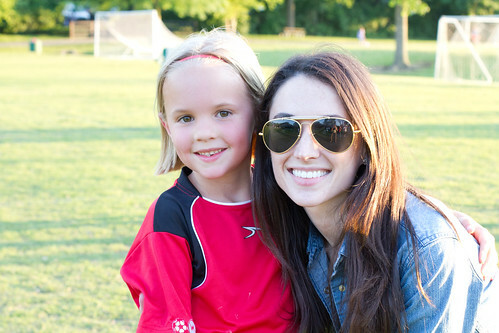 She championed Lou on the soccer field, just as she’s done all year long in the classroom. And this is why Lou will always bee her #1 fan.